Eighty-five per cent of the new educational programme — including teacher training, the provision of Internet access in schools and the distribution of new course work textbooks — is complete, says Minister of Education Tarek Shawki. 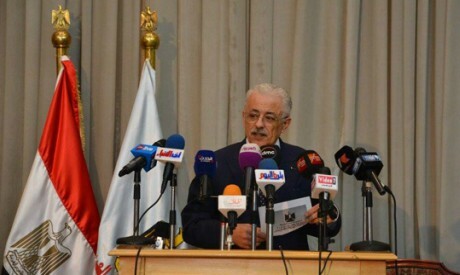 Speaking at a press conference, Shawki said the roll-out of the reforms had “exceeded all expectations” and remaining student books and teaching guides would all be distributed by the end of this week. Under the reformed system all secondary schools are linked to the Egyptian Knowledge Bank, an electronic educational encyclopaedia, and the division of high schools into separate science and arts sections has been eliminated. Students will be able to take a wider variety of courses, and universities have been given greater leeway to determine their selection criteria which can now include grades, exams and interviews. “Five million parents are satisfied with the new educational system,” said Shawki. He did, however, note that the problem of high class numbers will take a decade to solve since it will require “the construction of 22,000 classrooms at a cost of LE100 billion”. During the conference Shawki said the latest shipment of 100,000 Samsung tablets had been received. The Education Ministry has set a target of one million tablets, worth LE1.4 billion, to be distributed among secondary students. Howaida Kamel, a director at Downtown Cairo Educational Administration told Al-Ahram Weekly that schools in the district will begin receiving tablets within two weeks and had been told that all secondary students will be given a tablet by the beginning of November, adding that all schools in the district had the infrastructure necessary to connect to the Internet. Despite the minister’s insistence that the new school year has started smoothly many parents complain their children have yet to receive course books, including those containing amended curricula. Mamdouh says that though she has been informed the curriculum for her daughter in grade three has changed and that there is a new package of books for mathematics, social studies and science, the second week of the term is almost over “and still nobody has set eyes on the set texts”. Last week Shawki toured several schools in Assiut governorate. During the tour he said 98 per cent of course books had been printed and would be distributed to students within days.